He has a respectable average of 62.33. But he scored 303 of his 374 runs in one innings (81.0 %) and never made another score above 50. To be precise, his next highest score is only 26. It is hoped that he will play at least a few more Tests and score more centuries. Until then, he holds a couple of records in all Tests. This does NOT include the highest maiden century, as Gary Sobers (365*) and Bob Simpson (311) are ahead. KK Nair heads this list, ahead of England’s RE Foster who held the record for about 113 years. His 287 was the world Test record until early 1930 when Andy Sandham made 325 (in his last Test), though Bradman crossed it with 334 later the same year. Foster, Kuruppu, Fawad Alam, K Ibadulla, C Bannerman and A Jackson were making their Test debuts. Gillespie made his only century in his last Test while batting as nightwatchman. There are several other current players here led by MT Renshaw with 184. No one has scored more than three centuries without a fifty. For a short time KL Rahul shared the record with Bopara. But Rahul scored his first fifty soon after he scored his third century. As we can see, KK Nair is the only one to score a triple century but no fifty. David Lloyd and Brendon Kuruppu are the only ones to score a double century but no fifty. And Ravi Bopara’s Test career may be over, but he also holds a record which may not be broken for a long time. 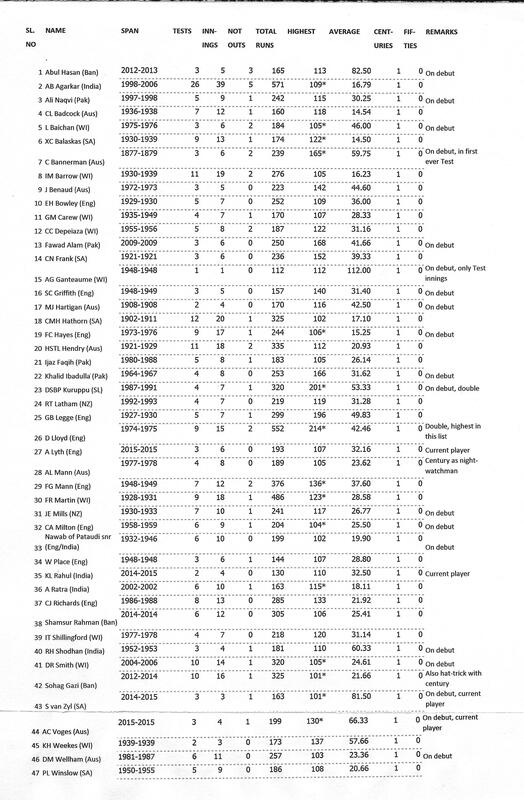 KK Nair is also the only current player with one or more centuries and no fifties. As we see, there are numerous players who scored one century and no fifty (including Agarkar and Ratra from India in recent years). A small number made two centuries and no fifties. A few of these players, notably those from Pakistan, vanished from the scene almost as quickly as the hapless Rodney Redmond did. At least he had the satisfaction of seeing his son Aaron play 8 Tests, with two fifties and a top score of 81. There are players like CPS Chauhan, KD Mackay and SK Warne who have made many Test fifties (16, 13 and 12 respectively) but were not able to reach three figures in their fairly long careers. There were some like C Vaas and A Kumble who did make one century towards the end of their careers. Here we consider the opposite case-of those who scored centuries but no scores between 50 and 99. There are as many as 47 who scored one century but no fifty. A few are current players. A surprisingly large number had scored centuries on their debut. These include B Kuruppu, who scored a double century on debut. However the highest individual score in this list is D Lloyd’s 214*. Other famous instances here include those of C Bannerman (165* in the first ever Test) and AG Ganteaume (century in his only innings). RE Redmond is not here as he made a fifty in the second innings. Among current players we have A Lyth, KL Rahul, Sohag Gazi, S van Zyl and AC Voges who should soon get off this list. There are some cases where this Test century was their only first-class century, such as CC Depeiaza. Next we look at those who scored two centuries but no fifties. This list is considerably shorter. H Graham scored a century on debut, while Wasti scored both his centuries in the same Test. And there is only one who has scored three centuries without fifties. He can be called a current player but is probably not going to play in Tests again.